Golden Flower’s School in the UK focuses on Tai Chi as a practice for radiant health, emphasizing vitality, awareness and good feelings. The UK School was founded in 1980 by Master San Gee Tam whilst he was training with Master Chu King Hung in London. Master San Gee Tam now lives in the United States but all the UK instructors continue to train personally with him on an annual basis both at the School’s headquarters in the United States and in Europe at Retreats and Instructor Trainings. Our Instructors teach at various locations in the UK but we also work and train together as a team and have developed a thriving, Golden Flower Tai Chi Community among ourselves and our students. Currently Golden Flower’s UK Instructors offer classes in Oxfordshire, North London, Hampshire, Chichester, Bognor Regis, Emsworth, Slindon, and West Sussex. The UK School focuses on the co-creative process with the greater, international Golden Flower Community. We enjoy regular visits from Master San Gee Tam and The School’s Senior Instructor, Annukka Holland. Their workshops and private lessons are an essential for the growth of the School as well as for the growth of each Instructor, and by connection, each Student. The UK School also holds regular workshops with European Instructor Job Koesoemobroto, as well as other Tai Chi Instructors from throughout Europe. There are many memories of when we gather together as group – when we have been training together for a few days we get in sync and have a lot of laughs. But my overall favourite time was in 2011 I was transitioning from a 21 year career in scientific publishing to becoming a full-time Tai Chi teacher. I knew I needed help with the process so I went to spend two weeks with Master San Gee and Annukka at Heavenly Way. I had private lessons a got some very useful feedback about myself. Getting very personal feedback was not easy but as I assimilated it I was able to take a big step forward in my own growth process. The process of becoming a full-time teacher has always felt like fulfilling a purpose in me. How long have you been practicing and teaching? Having started Tai Chi in 1984 I took a break in 1991 until 1998 when I was ready to start again. I formed my first class in 2003 and now the ever expanding Oxford school offers 8 weekly classes. At the core are the double sessions on Tuesday and Thursday evenings, lasting two hours and catering for beginners as well as intermediates. Seniors classes are twice per week in private housing estates for retired people, their programme is tailored to seniors. I teach a weekly therapeutic class in a residential clinic specialising in trauma, the Tai Chi work is complementary to the core Somatic Experiencing. Importantly for the growth of Golden Flower, is the weekly class for trainee instructors – this focuses in more detail on the GF curriculum as well as some of the ancillary material. Marie Carty ,Tony Phelan, Paul Smedley, Gill Williamson and Vicky Sheldon are trainees. Myself and Herts-based Instructor Janet Sewell recently led an 8 week ChiSource course, this was a success and the group now meets monthly to share and support each other. www.taichioxford.com for more info. I spent 21 years working in publishing and as a director of a medium-sized organisation learned and practiced management and leadership alongside my natural commercial focus. I always knew that I wanted to do something more in tune with the change that I want to see in the world – so jumped at the opportunity to become a full-time teacher in 2011. Why do you love Tai Chi? I love Tai Chi because it was the answer to what I was looking for: a class that incorporated physical exercise, was stress relieving, relaxing and was holistic. That is, it also had a positive effect on my health and wellbeing at the emotional and mental level too – and importantly for me provided some spiritual ‘nourishment’. I love the fact that in Tai Chi I am surrounded by people I can relate to easily. It is good to connect with people who are, or are becoming more self-aware. Tai Chi has been an excellent way for me to develop myself personally and I have gained great insights and understanding of ‘life principles’ knowing more clearly what works. I love teaching Tai Chi and the energy it brings to me and my students. It’s so lovely to see the positive effect of Tai Chi and the difference it makes to people’s lives. What is your favourite Golden Flower moment? Starting the Tai Chi Training in 1991 and meeting my future husband, sharing our interest in Tai Chi and getting it out to people. Going to Siberia was a highlight and a bit of a culture shock, I’m sure it helped awaken me and was a learning experience that has strengthened me. Meeting the wonderful people in Omsk who attended the workshops and hearing their stories. Getting married and going on honeymoon to America and being able to do Tai Chi with San Gee Tam and Annukka and seeing the beginnings of the Golden Flower school in Winston Salem. Visiting Heavenly Way last year and participating in classes and workshops and experiencing the welcoming and harmonious atmosphere that pervades the whole area. One moment that is significant is overcoming my fear of horses following a very bad riding accident. I was able (with Trish’s support) to get on a horse again after 36 years. Many wonderful moments when we get together as a group of instructors and practise Tai Chi and generally reconnect. I have been teaching Tai Chi since 1994 when I taught in the London area. Since 1996 and moving to West Sussex coast I have been teaching in the Chichester area. I teach 7 classes at the moment. These are for beginners, intermediate and advanced students. In addition to that I teach regular weekend class and workshops with my husband Martin. who have been with me for years. It’s great being part of a bigger community that is international in scope and I am grateful that I have found the right ‘outlet’ to express my knowledge and enthusiasm for Tai Chi thanks to San Gee Tam and the Golden Flower School. I have been thinking about this question for a while and for the moment the best answer I can come up with has to do with relationships. Tai Chi is the best teacher in all aspects of relationship. As I learn tai Chi principles and learn to integrate them – life gets better, I feel better, people around me feel better. It’s not about what words you use so much as the energy or chi you ‘emit’ or radiate. I love Tai Chi because it can change a conflictual situation into a harmonious one at all levels. It makes it clearer how to resolve inner conflicts, interpersonal one’s and even my own relationship with life. I love the growing awareness it brings and sense of connectedness, connection, the elimination of separateness – pointing to the truth of harmony and synthesis. Put it more simply I love the energy Tai Chi gives me – not just quantatively – but qualitively .. it makes me feel good .. raises the vibe… generates happy chi. More things are possible coming from this state. There is the relationship I have with other students (fellow instructors) when learning Tai Chi at a deeper level. There is also the relationship between us as students and the master (San Gee Tam) and his generosity of spirit and lightness in conveying what we most need to learn appropriately to the time. There is the relationship I have with my surroundings, nature, life itself. The Yin and Yang and how my energy effects everything I do and the results I get. I don’t always get the results I like but Tai Chi can help me understand where I go ‘wrong’ and support me to go ‘right’. If I look back over my story and Tai Chi journey I cannot say it’s just energy that makes me love Tai Chi (O.K maybe I can as everything is energy…. but I want to be more specific). I love Tai Chi because of how it energises me and gives me more life. I love that it helps not just me but everyone who wants become more alive and creative. I love how positively Tai Chi can effect relationships of all kinds. Tai Chi is a gift and I love to share it and I love how it changes people’s lives for the better. . I love the fact that Tai Chi provides a dependable pathway to better health at a physical, emotional, mental and spiritual level. Personally Tai Chi has helped me stay focused and flow more – and struggle and stress less. I love the depth of Tai Chi and the fact that there is always something ‘new’ and inspiring to learn so that things never get stale. There are many moments but one that springs to mind is a being part of a Golden Flower ‘entourage’ which flew to and from Siberia in some very ‘interesting’ ex-Soviet air transport to Omsk in Siberia just after it had opened up to the Westerners in the early 1990’s. Everything about the trip is memorable but one of my favourite moments was when San Gee Tam empowered Sarathi, one of my fellow trainee instructors, to lead a workshop for a big group of Russians which involved using a translator to communicate the practises we would be doing in the workshop. Sarathi had to think on his feet and come up with material as we had not anticipated the great demand there would be for the work we were presenting. San Gee Tam’s workshop was over-subscribed. I don’t think I have ever seen such a massive transformation in such a short period of time. I was fortunate enough to be assisting Sarathi and the experience is one of my treasured memories. He did a brilliant job and lightened up the whole room with his compassion, humour and playful energy. What started off as a fairly dour, serious event soon changed when the group were introduced to practices we had learnt in Golden Flower and self-cultivation. We were doing things that must have appeared very, very silly to them – but it worked well to break the ice and elicit ‘happy chi’. The experience does not communicate well in writing – ‘you had to be there’ I can only tell you there was much hilarity, good humour and happy chi. There was a real sense of liberation and freeing up of energy and I can’t believe how focused and eager and hungry everyone was to learn. The generosity, warmth and kindness of the people I met will never leave me. I am proud to have been part of something with a big purpose. The Tai Chi and associated workshops presented over two weeks in Siberia – led in a very positive direction and eventually to the growth of the biggest Golden Flower School anywhere. I met Vladimir in Omsk and he really took Tai Chi on and developed the school in a place you would not have predicted such a following. My other favourite Siberian Golden Flower moment is the look of surprise on people’s faces (including Annukka’s) when she was ‘pinging’ some massive macho Karate students around the room, and I don’t think even the all Siberian Karate Champion (who was present) could move her. It was very impressive. Organisationally and logistically this was an extremely difficult trip to arrange and make work out right. So many things could have gone wrong, and nearly did. I have to pay tribute to San Gee Tam and his clear intention and focus. Without that I think we might be telling a different story. San Gee Tam spoke at some massive public meetings and not all the audience were receptive to a westerner sharing their ideas and wisdom in the beginning. It was very apparent that San Gee Tam had mustered all his focus and presence to really ‘be there’ or should I say be here. Anyone else in that position at that particular time in history (given the ideological differences, beliefs and feelings strongly present at the time) may have felt the need to flee from the building. However, San Gee Tam dealt with everyone’s questions very appropriately and those people that needed to be part of the experience stayed and participated over the next two weeks. Apart from meeting my wife Tricia through Golden Flower my other favourite Golden Flower moment is finally getting to see the beginning of the Golden Flower School in 1995 and more generally, loving the whole of our trip to America . As part of our honeymoon we spent time at a wonderful resort in Chetolah and attended a Pushing Hands workshop in Winston where we met Marc and Wendy and other Tai Chi students. I also began starting work on my Tai Chi Instructor Test while I had the opportunity to work with San Gee Tam. [Sangee was no longer on our ‘doorstop’ – around the corner from us – after he moved to U.S in 1994]. I always look forward to the chance to meet up with fellow instructors from Europe and America and look forward to meeting up and /or reconnecting with some of the Russian ‘Golden Flowers’ soon. It really feels good to be part of a genuinely international community that can make such a positive difference in the world. Our trainings together seem to get better and better each year and long may it continue. I have been teaching with Golden Flower since 1996 mainly in the Chichester area. I currently teach a Golden Flower evening class each week on a Monday and also present Tai Chi workshops at various weekends with my wife Tricia. I am a qualified social worker and worked for many years in front line services. I am currently working within a local authority with teenagers and their families – helping to find and co-create solutions that promote improved communication and relationships. I have years of experience working with people using the Solution Focused Brief Therapy approach and some NLP. I find the application of Tai Chi principles in the context of daily living support my work in a very positive way – both personally and professionally. Tai Chi has transformed my life and it is just getting better and better: Through the application of Tai Chi principles to all areas of my life, I have been able to find inner calm and focus to achieve a greater awareness of what I want in life and seeing new possibilities. The practise of Tai Chi has strengthened me mentally as well as aiding me in overcoming physical health problems such as back pain and fatigue. I am continually inspired by Tai Chi and it provides me with the opportunity to make a difference in both my life, and the lives of those I work and live with. There are so many of them; I love the fun and laughter, the sense of community and friendship and being accepted for who I really am. My daughter’s words on our first visit to Heavenly Way, (she was 10 at the time), embodied these feelings, saying after a day that it ‘feels like home’. Years of Tai Chi practise. Classes I lead or have led. My unique knowledge and experience through the combination of Physiotherapy, Tai Chi and Reflexology allows me to approach each student as an individual to support them as a whole being in their Health and their Self-development. From the very earliest couple of classes I took, I immediately realised how vital Tai Chi could be to maximising and maintaining my general wellbeing in a fun and simple way. Yet beyond this vital realisation, little did I realise the fantastic impact and extras that came with that one small step to participate in a class. The Golden Flower classes and school have been an incredible additional source of fun, friends, new experiences and knowledge; expanding and making me a better person. I could never have taken on the things I have without the foundational skills and practices Tai Chi has brought to me, skills I can now apply anywhere in my life. So my career, ability to learn and life generally has taken on new levels through Tai Chi. It only takes one small step to have a go, so take that step and have fun! Oh so difficult! On retreats, with timeless days like childhood, filled with activities, Tai chi, and with evenings and quiet times watching the changing sun on the hills near the Heavenly Way Retreat Centre. 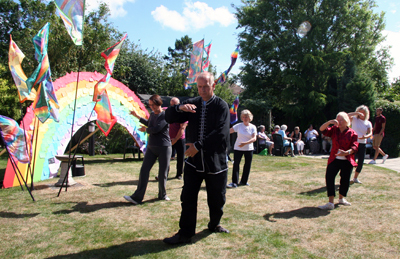 Being filled-up with the deep satisfaction of the Tai Chi group energy and peace. Trail rides and connecting with the horses. I have been enjoying Tai Chi for 15 years along with the other practices the school offers and have regularly attended retreats, instructor events and additionally take private lessons with the Master of the School. Look out for new classes, to be announced, commencing sometime in 2014. Location: In and around the North London and Hertfordshire areas. T’ai Chi is not just found in movements, it is life, life itself; sometimes experienced in a subtle way, but most of the time t’ai chi simply lives with you, is in you. Once you are aware of it, it won’t leave you. With t’ai chi I learn every day how to be, simply, myself. Out of many favourite moments, my finding t’ai chi for the first time 4 years ago, taught in a beautiful garden, when I connected with its magical purity mirroring nature that is all around us. Began teaching t’ai chi in January and decided to put my PhD on hold. Poor health drew me to Tai-Chi, I found that it helped me greatly. The exercises, relaxation techniques and the form were all taught at a pace that suited me. Now my health and energy are so much better . When you find something so good you don`t let it go. I`ve grown and learned much but the best thing about Tai-Chi are the people I`ve met and how supportive the groups are of each other. I have attended Tai- Chi lessons for ten years now. I started by attending a weekly class. I am now assisting Heike [my instructor] in four classes each week as a Trainee Instructor and wish to start a class of my own soon for beginners. I`ve got so much from Tai-Chi that I wish to share what I`ve learnt with others. My favourite Tai -Chi moment would be when I attended my first Instructors training in North Carolina U.S.A. at `Heavenly Way`. The sunrises were so beautiful, I sat each morning and watched them, and felt at peace with myself, and this is how you can feel about life if you practise and learn more about Tai-Chi. The energy that is created by a group of people practising t’ai chi together is special but leads to joy that expresses itself in an uninhibited fun and laughter. Spontaneously breaking into song, or dance, feeling like a VI former again and more youthful is one of the many reasons. With hindsight I now think I was dysphasic as a child and did not know my left from my right, making me clumsy and badly coordinated. This put me off fast sports and I am still not a fast learner when it comes to physical skills. However, learning t’ai chi and seeing my own progress over time has given me new confidence that I can develop better coordination and balance. I certainly have learned to listen to the signals from my body better. Incorporating the principles of yin and yang into daily life and interactions with other people have kept me calmer and more in control in what would have been confrontations. I think it has kept me safe, reduced stress and made me more skilful and able to support others. I could go on……. Trying to isolate a single favourite T’ai chi moment is difficult because there are so many. A strong memory was that of looking up in the chapel at the funeral for my husband to see the whole of my local class had turned up and were taking up a long pew. They were there to support me and knowing that they were sending positive energy, I was able to draw strength from them that I needed at that moment. Another strong memory was early in the morning at Heavenly Way, when there were wisps mist trailing upwards and the sun was rising with hanging rock on the far horizon making an interesting skyline. A group of us were warming up outside breathing beautiful air, to some music with the refrain, “It’s good to be alive” and it was. I counted myself very fortunate to be there at that moment having that experience, knowing that it was good for my body, mind and soul. I started to attend Golden Flower classes in January 1999. The reason for choosing to study T’ai Chi stemmed from a half hour taster session on a Buddhist retreat which showed me how badly I had been treating my body. I discovered that I had a chest infection and the tension in my shoulders was affecting the mobility in those joints so that I thought I had a frozen shoulder. It was a wake up call. As a head teacher of a special school and mother to three children, I had learned to ignore the signals from my body in order to get through day after day of gruelling routines. I saw an advert by a Golden Flower T’ai Chi teacher and phoned him. When he assured me that the learning was not incremental and that missing lessons due to work commitments would not leave me floundering at the next lesson, I joined. The first lesson made me wonder what I had signed up for but one of the unexpected great joys of the school is that some of the people attending that first class, are now among my closest friends and knowing them has enriched my life.